FitnessPlus is a highly energetic business in south west London offering personal training services. Business owner, Dean Johnson, needed a website that kept up with his growing business. He came to us seeking a website which he could also use as an ecommerce outlet for fitness products. Dean chose our NRGY theme from our library of themes developed for our Pro Package customers. Our Pro themes were created in concert with our talented design partners at Collaborative Thought. Our Pro themes are a cost-effective route to a sleek and unique website. 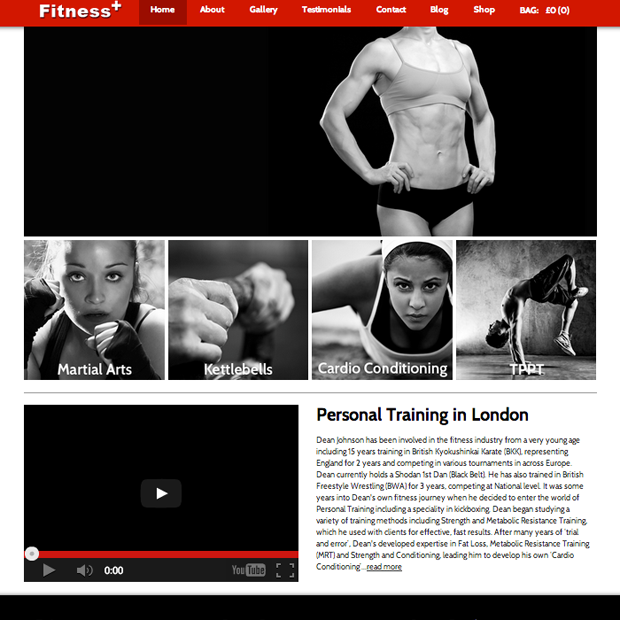 For FitnessPlus, we customised the NRGY WordPress theme to work as a personal trainer WordPress theme. Our personal trainer WordPress theme includes a responsive design and follows a mobile-first approach for its implementation. FitnessPlus attracts tens of thousands of visitors every month. They started with a full featured website and an attractive personal trainer WordPress theme. From this base, Dean and his team have nurtured and grown the site as a very successful personal trainer website. The FitnessPlus blog is packed with high quality content. Unique content is one of the most important elements in the development of a site’s online presence. Dean does a fantastic job of posting content to his blog on a weekly basis. He has also created very relevant content including reviews of fitness products, inspiring thoughts for his ‘Motive Mondays’, and fun facts for ‘FitnessPlus Fact Fridays’. These sorts of recurring themes bring his readers back to learn more about fitness and healthy living. This consistent creation of content can bolster his site’s search results and generate leads and sales. A blog comes standard with any of our website packages and we encourage all customers to develop their own unique content. FitnessPlus has utilised guest bloggers. FitnessPlus has taken the enterprising step of involving guest bloggers at very regular intervals. While this offers the business an additional revenue stream, it can also boost their site’s search rankings and authority by containing a wealth of high quality content related to their niche. They extended their site’s functionality to include ecommerce with the Woocommerce plugin. Adding a retail component to the website provides yet another revenue stream for the business. How can this website help your business? FitnessPlus is a prime example of using a WordPress website to create lots of high quality content to enhance a site’s search rankings. There is no better way to raise your online profile than consistent creation of relevant content and FitnessPlus creates a large amount of content every week. Their active curation of their site’s content can serve as an inspiration and demonstrates a real commitment to pushing their web presence forward. While engaging, relevant content (rather than ‘spammy’ or cynically SEO targeted content) is important for developing your site’s web presence, FitnessPlus could benefit from a slightly more targeted approach to their content marketing as the personal trainer space is very competitive in search engines. Looking for a personal trainer WordPress theme for your business? Let us put our experience work for you. Contact us and let’s work together!